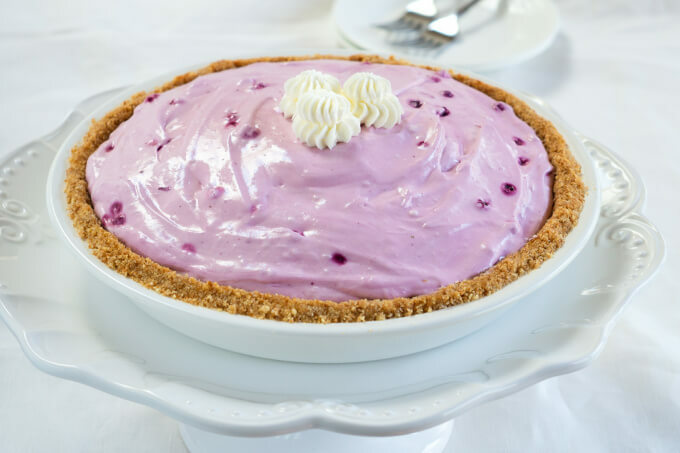 6 Ingredient Blueberry Lemonade Cream Pie Recipe comes together in a fast 15 minutes. It is creamy dreamy delicious. 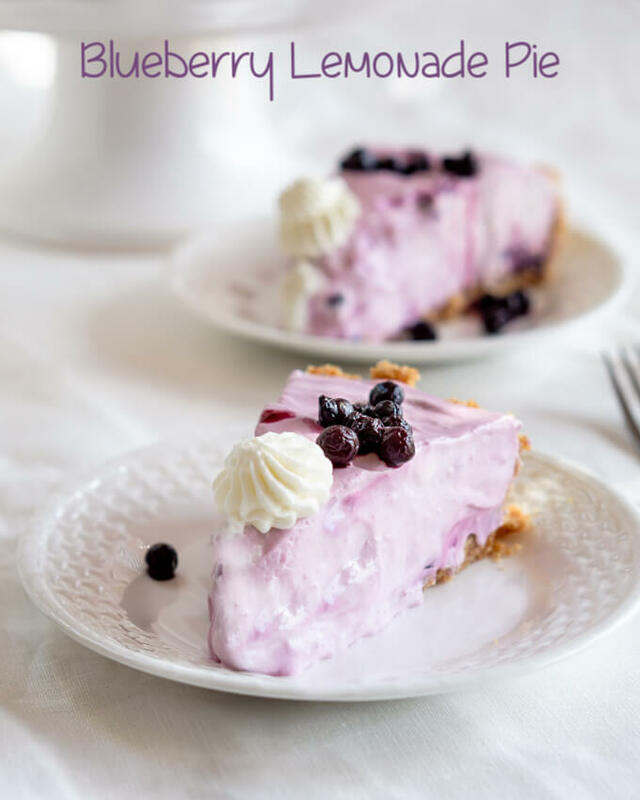 Blueberry Lemonade Cream Pie recipe is just perfect for anyone that knows how to use a spoon. Don’t you just love a recipe that comes together in just minutes? I wanted to add another cream pie recipe in anticipation of coming out of my cave after a long winters snorefest. 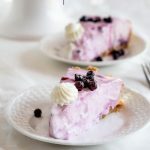 It will make my 5th creamy pie on the blog and considering I wanted to call this a 5 ingredient Blueberry Lemonade Cream Pie but thought you’re going to want a crust, so settled for 6 ingredients. The color of this pie is quick to get attention. I didn’t think it needed a lot of whipped cream topping so just added a small dollop. I made extra and put it in the fridge. After making this easy pie recipe John offered to get us a couple of slices after dinner. Evidently, his piece needed a much bigger mountain of whipped cream than mine did. Mr. Sweet tooth didn’t surprise me one bit. This is such an easy pie recipe to make. 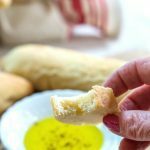 I love recipes like this one for holidays because they are so quick to make up and simple to serve. This is also a refreshing dessert pie recipe to make when the weather starts turning warmer. Hands down Blueberry Lemonade Pie is one of the best pie recipes that I’ve made and eaten. Even though this cream cheese pie comes together in a quick 15 minutes, you can put the filling in any crust you desire. I made a Nilla Wafer Crust but you can buy a graham cracker or a pastry crust. Since this pie doesn’t need to be baked just make sure you put it in a cooled and pre-baked crust if you bake one. There is a video in the recipe card showing you how to fold the whipped topping into the pie ingredients. When adding the whipped cream to your other ingredients don’t stir it, fold it in. If you stir it you will break down and deflate the whipped cream. Use frozen wild berries. They are smaller and more flavorful than what I can get in the Midwest. Their juice gives this pie it’s pretty color. This pie can be made a day in advance. Chill it uncovered in the refrigerator and once cold cover it lightly with plastic wrap. Make sure that the pie is completely chilled before cutting it. Don’t leave it out. Return any leftovers to the refrigerator immediately. It will not melt but will become soft and lose its shape. If you like this recipe please leave me a comment below and a 5-✭✭✭✭✭ rating. Here are a couple more recipes I think you’ll enjoy. This Serrated Knife is a must in any kitchen. It’s been the #1 knife for Cooks Illustrated for years. I have knives that cost triple what this one does but I can’t live without it. The Pie Server you want should have a pointed tip and a bend in it to lift the slice of pie. Pie Plate – I have several pie plates but one thing that I’ve learned is that food looks great in a white plate. I personally use this pie plate for my colorful pies. If you make any of the recipes from Hostess At Heart give me a shout out on Instagram with hashtag #hostessatheart or tag me @hostessatheart. In the bowl of an electric stand mixer, beat cream cheese until light and fluffy. Add sweetened condensed milk and lemonade concentrate. Blend until mixed. Fold in blueberries and then whipped topping. Pour into the pie crust. Chill for 4 to 6 hours or until firm. Garnish with additional whipped topping or blueberries if desired. Store leftovers in the refrigerator covered lightly with plastic wrap. I made a vanilla wafer crust but you can make or buy a graham cracker or pastry crust. Pre-bake and cook any crust prior to filling. The nutritional data doesn’t include the crust. I love love love easy pies like this! Thanks for all the tips about the crust and folding in the whipped topping. Bookmarking for when blueberry season comes around! Thank you, Trish! I sure wish I had access to blueberries but would gladly take a trip to the beautiful Northeast coast for a bucketfull! 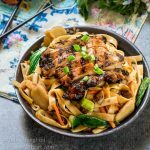 I’m not sure what I love most about this recipe….the color, the flavors or the simple and quick prep. Summer BBQ season is looking up! I would definitely take this to a pot-luck! Thank you, Debra! This would be perfect for a summer BBQ! I absolutely LOVE the color of this pie!! It’s perfect for Easter!! I love dessert recipes with just a few simple ingredients! This is PERFECTION! Thank you, Brandi! Me too! Blueberries and lemons are absolutely made for each other. Something about that bright citrus punch just perfectly mellows the blueberries and adds an acid punch to their sweetness. I love the idea of a nice light, airy pie that combines those flavours together. Cheers! Thank you, Sean! I love that flavor combo too! 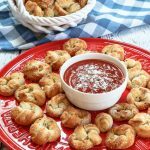 I love love love how easy this recipe is! I’ve been getting more comfortable with baking simple things like muffins and breads, but I’m always hesitant on stepping into the big game with cakes and pies and other “fancy” things, haha. But this! This I can do. Further to that, blueberry and lemon is my absolute favorite flavor combo in desserts. SO GOOD. Thank you so much Dana! I love trying new things but a no-bake pie is quick and easy when I need that! I just made my first no bake pie the other day and now Im on. mission to try ALL the no bake pies! This sounds, sweet, tart and I LOVE LOVE LOVE the pretty color too! sounds delightful! I know my family will love trying this!! This is beautiful! And only 6 ingredients! Count me in! It’s perfect for Mother’s Day! I like how quick and easy it is to put together this delightful refreshing dessert. Blueberries and lemons are two of my favorite things. My mouth is warering. Now this I HAVE to try. Blueberry and lemon pie are TWO of my favourites. Combining BOTH into one is AMAZING. Now I don’t have to decide which one to make. BONUS points to this being so easy to make too. This sounds like everything I want in a pie, easy + delicious + colorful! I appreciate the tip about the frozen wild berries being a better bet than fresh. This makes this pie totally accessible to make year-round.